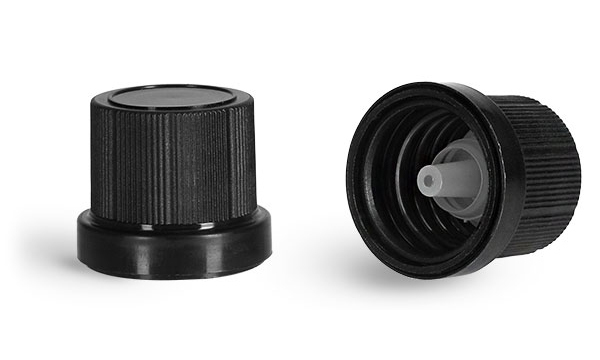 These easy to grip ribbed black polypropylene tamper evident caps are slightly wider than our 2013-07 line and include LDPE orifice reducers that feature a shorter tip, which does not extend quite as far into the bottle as the 2013-07's. These inserts have a 1.5 mm orifice, and a short, wide tip that rests inside the neck of our glass euro dropper bottles. The orifice reducer plugs the openings of the bottles, allowing for a tight seal. The plastic caps feature a smooth tamper evident ring that will detach from the cap skirt and remain on the bottle upon its first opening. Note: These caps must be screwed on tightly for the orifice reducer to fully insert into the bottle neck and for the tamper evident ring to tear.